My amazing Paphiopedilum Fairrieanum fairy orchid gave up his petals this past Friday. His friend and fellow paphiopedilum had just started blooming right next to him about a week before, so it was almost as if Mr. Fairy waited until he could properly pass the baton to another happy smiling orchid face in my studio before he fell off his stem. Like many people, I’m learning to be better about flowing through the changes in my life. Just this past week, I did a healing with a client to be able to feel safe as she goes through her major shifts. She is getting ready to graduate from college and was already sorry about being away from her friends. I feel that this is a healing from which most of us could sincerely benefit – to be able to feel safe, whole and content as we flow through the inevitable changes life brings. Most of the time we cling, we fret, we worry, we hold our breath and then all of a sudden we go down to our studio and the bloom has fallen. Suddenly life looks a little different than it used to do. My orchids give me so much practice with this ability to flow. I feed them a combination of fertilizers. In one gallon of water, I usually put special orchid fertilizer 20-10-20 along with one drop of Super Thrive. My orchids get fertilized every time I water them. The usual wisdom is to water every 2 days for a 2 inch pot, every 4 days for a 4 inch pot, every 8 days for an 8 inch pot and so on. But the truth is I usually just tune in with them and then generally everybody gets watered and fertilized all at once. Otherwise the ones not getting water might feel a little neglected, after all! I used to not be so good at this fertilizing thing, but then I met with a professional orchid grower and he helped me wise up to what would make Mr. Fairy happier. Shortly after I began using this particular fertilizer routine, Mr. Fairy bloomed for the first time in 1 year and 9 months. I am happy to report that he basically bloomed for me from mid December through early April – about four whole glorious months. He accompanied me through a major change – the breakup of my engagement to my fiancé. Mr. Fairy had begun blooming down in Florida and I had to put him in a box when I drove eight and a half hours back to Atlanta. A wonderful moving guy, Moe Doss, Moe’s son and Moe’s father, came to pack up my worldly goods a few days before Christmas. My most precious belongings – including Mr. Fairy orchid and my dog Belle – came with me in my Prius. I was a little nervous when I put Mr. Fairy in the box, but then again what could I do, we all had to make the best of it. When I arrived back in my beloved home in Atlanta to unpack, lo and behold, Mr. Fairy was still miraculously perfect. 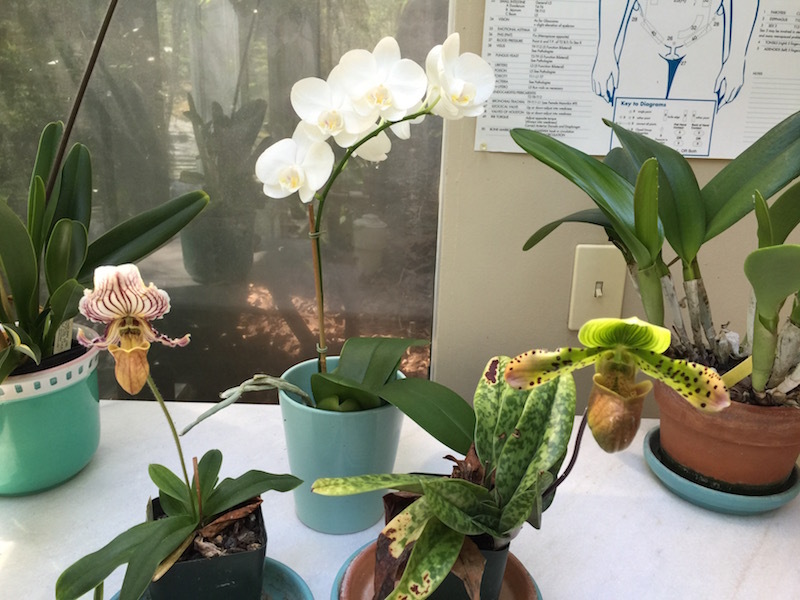 He had not been bothered one bit by my move and continued to bloom gloriously down in my healing studio, where my other orchids have been so happy for years. Like Mr. Fairy, I bounced back from the move much more easily than I would have expected. I too was so happy to be back in the right place for me, back in the home I have lived in for 18 years, the place where I work, raise orchids, enjoy my hammock on the back porch and spend so much time outside in my organic garden. I resolved that the next time I’m leaving here for good is when they take me out in a pine box. I cried every day for awhile – not necessarily long bouts of crying but periodic bursts of tears for a few minutes at a time. The feelings would come up, I would feel my grief and then it would go away for awhile. I worked hard to have a good attitude – I prayed constantly, I made lists of all I am grateful for – but there was nothing I could do about this crying thing. It was all just part of the process, crying myself back to normalcy as if I was watering and fertilizing my soul at the same time. Meanwhile Mr. Fairy had his moment of glory. I was unexpectedly asked to speak at the Primrose Garden club one Tuesday morning. The invited speaker had gotten sick, then the backup speaker was unavailable, so I was invited to talk about flower essences and naturally I brought Mr. Fairy, Paphiopedilum Fairrieanum, as well as my Paphiopedilum Haynaldianum. Mr. Fairy got passed around the room so that everybody could properly ooh and ah over him. After all, he is a rare endangered orchid. There are orchids and there is Mr. Fairy. All living beings have a unique vibration. To me there is nothing quite like Paphiopedilum Fairrieanum medicine – you can hear about his smiling face but seeing it in person will truly take your breath away. Eventually about a week ago I was out for a walk in my neighborhood taking photographs of the flowers throughout my Atlanta neighborhood that I love so dearly when all of a sudden I realized that I am now back to myself – whole, complete, content, nothing missing, just plain happy, just plain me. About a few days after I realized that I was finally back to myself, I noticed that Mr. Fairy seemed to be saying goodbye. His bloom began to turn color and I knew that he was signaling to me that it was finally time to let go. Once, years ago, I had known that my cat Rascal was dying. “How do you know?” a client of mine had asked me. “Because he’s my cat,” I replied. With Mr. Fairy, it was the same way. To anybody else, he might have appeared just as truly fantastic as ever, a sweet glorious Paphiopedilum Fairrieanum. But he and I shared an understanding, and I knew it was time for him to let go. Thank you for accompanying me through a major life change. Geat info , and analoy!